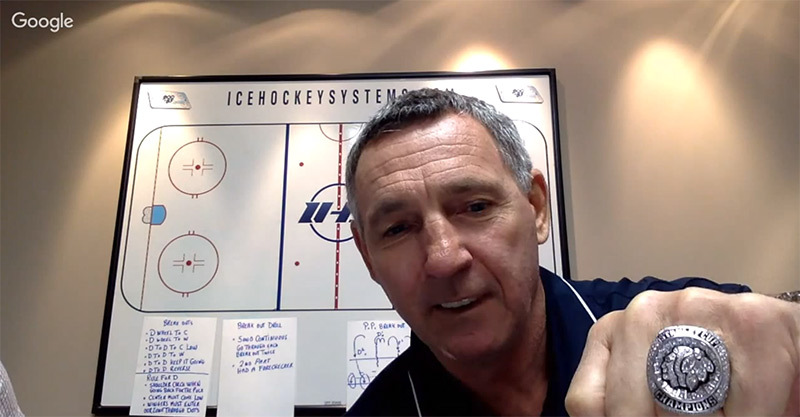 IHS Blueprint Webinar with Denis Savard | Ice Hockey Systems Inc.
We had a great time today sitting down with Hall of Famer Denis Savard. In the webinar Denis not only shows off the latest Stanley Cup ring, he also discusses keys to breakouts and power play breakouts. In addition to discussing the systems he also offers up some great drills to compliment these systems. Chris Howard (Ice Hockey Systems President) gives a quick overview of IHS and some of the new features available to our members. Nils Satterstrom (Founder) gives a brief demonstration of Ice Hockey Systems Inc.'s new platform for organizations, Blueprint. View more information on Blueprint, a platform for youth hockey organizations. View the full webinar below! The animation below shows the continuous breakout drill that Denis demonstrates in the webinar. This animation shows the Wheel to Center option. As Denis explains you should give each unit the chance to do a few repetitions of each option. Other options could include (but not limited to) Wheel to Wing, Reverse, Wheel to Wing to Weak Side D.
To add pressure to the breakout Denis talks about adding players to the forecheck. They can line up next to the coach and the coach can release the desired number of forecheckers.